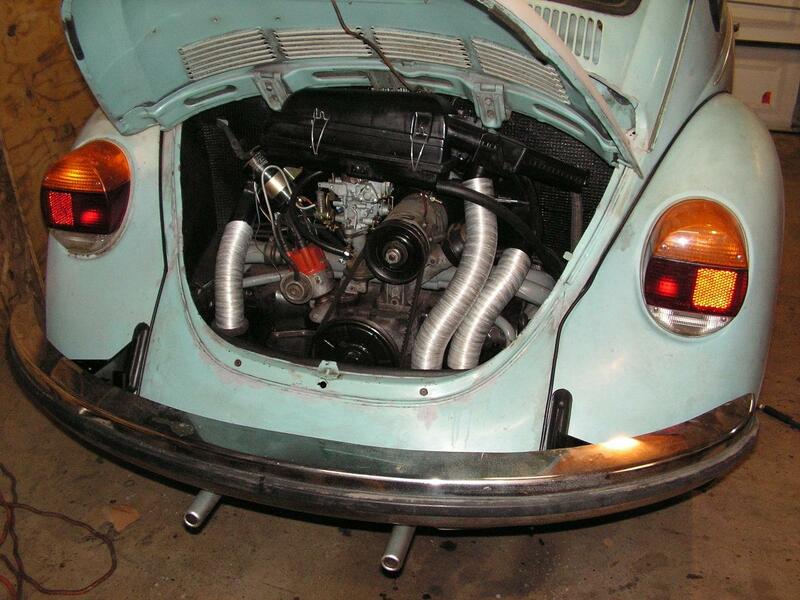 TheSamba.com :: Beetle - Late Model/Super - 1968-up - View topic - What did you do to your Bug Today? What did you do to your Bug Today? Posted: Tue Aug 07, 2018 10:26 pm Post subject: Re: What did you do to your Bug Today? Posted: Wed Aug 08, 2018 10:28 am Post subject: Re: What did you do to your Bug Today? 73slowbug, had to laugh at your post. Thanks for sharing, that's awesome. Also replaced all the gaskets on the 4 turn signals/brake lights as well as the license plate light. Repaired some wiring for the front turn signals along the way. Posted: Wed Aug 08, 2018 10:51 am Post subject: Re: What did you do to your Bug Today? 1. )tighten both adjusters on all 4 tires so that you can't turn the tires by hand; 2. )pump the brakes a couple of times between tightening of each wheel's adjusters. 4.) back of the adjusters a click at a time per wheel until the wheel drags but you can turn it w/out getting a hernia. This worked for me on my two Supers over the last couple of months. I have great brakes now, no double-pumping needed. Posted: Wed Aug 08, 2018 5:01 pm Post subject: Re: What did you do to your Bug Today? If you have to pump the pedal to make it come up, your brake shoes are too loose. Posted: Thu Aug 09, 2018 8:55 pm Post subject: Re: What did you do to your Bug Today? Hope its OK to post this Just don't want to throw away good parts. Posted: Sat Aug 11, 2018 3:29 pm Post subject: Re: What did you do to your Bug Today? I have been using a locking engine lid lock on my VWs, had one that I'd had around for a long time; problem is that for some reason I had only one key. I tried Ace Hardware and locksmith/key shops I'd happen upon, one even tried twice to order a key blank for it after I told them my VW "SC" key for glove box fit into the lid lock, but hadn't come through. Yesterday I stopped at a locksmith on Cave Creek Rd just north of Sweetwater in Phoenix, and the operator there had an Ilco 61VW blank which fit in, and he cut me a key that works (I had the lid lock with me to try). 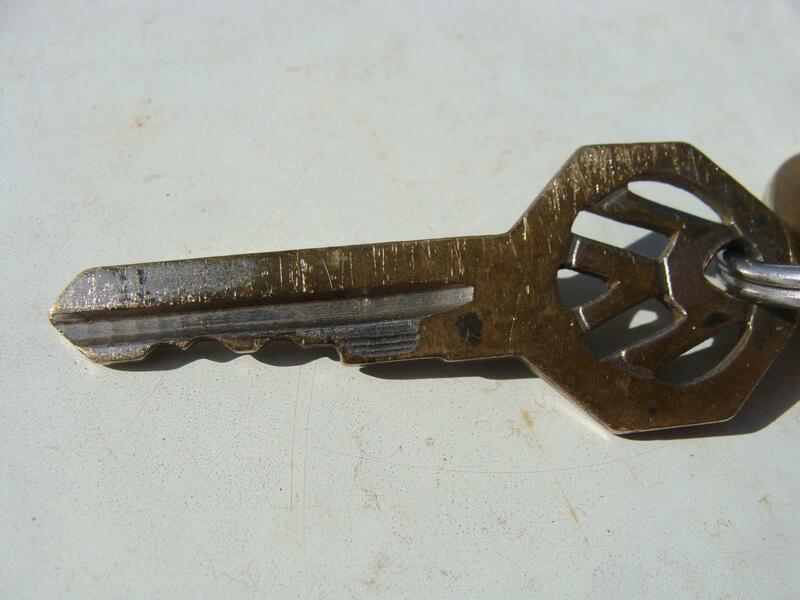 The Ilco key does not have the VW logo though. Location: Crappy town in a crappy state. But the beach is nearby, so I have that going for me. Posted: Sat Aug 11, 2018 3:32 pm Post subject: Re: What did you do to your Bug Today? If you possibly can, hang onto the original stuff. At some point you or some future owner may want to go back to stock. Posted: Sun Aug 12, 2018 7:24 am Post subject: Re: What did you do to your Bug Today? Working on an in-line fresh air/heat booster fan set up too, still in the "dry run/mock-up" stages on that though. Posted: Sun Aug 12, 2018 11:59 am Post subject: Re: What did you do to your Bug Today? Busy little Bugger, eh?! Post pics of that booster fan setup somewhere when it's done! Posted: Sun Aug 12, 2018 12:21 pm Post subject: Re: What did you do to your Bug Today? Posted: Sun Aug 12, 2018 4:01 pm Post subject: Re: What did you do to your Bug Today? I'm a slacker, I did nothing to my vw today I did take her out for a spin yesterday, then remembered the dire warnings and sound advice about moving the fuel filter out of the engine bay because of a fire danger, and put her back in the garage till I get it fixed. Posted: Sun Aug 12, 2018 5:13 pm Post subject: Re: What did you do to your Bug Today? Went to paint the intakes and alt stand and other bits... Somehow managed to dump a gallon of paint on my garage floor. Posted: Mon Aug 13, 2018 6:17 pm Post subject: Re: What did you do to your Bug Today? Adjusted my brakes. You don't realize how far off they are until you adjust them. This was the first adjustment I've dont in around 6500 miles. I think it might be time for brake shoes soon. 1973 "family heirloom" bug. Stock 1600 DP. SVDA,electronic ignition and Exhaust. Really Slow... Daily driven. Posted: Mon Aug 13, 2018 7:27 pm Post subject: Re: What did you do to your Bug Today? My idle has suddenly dropped to 800 or less. I checked the point gap, perfect, but timing was down to 7.0 BTDC at idle. I adjusted it up, checked for vacuum leaks, cleaned the idle port and re-adjusted the carb from scratch and rechecked the timing. Timing seems to be shifting w/the idle adjustment, I ended up leaving it a 8.0 BTDC. Doesn't seem right. I'll see how it drives tomorrow. Oh, points have about 5,200 miles on them. Gap is good but they're looking worn/pitted. I used a penny to clean off some of the roughness. Posted: Mon Aug 13, 2018 8:15 pm Post subject: Re: What did you do to your Bug Today? Spend the $4 on a set of points. Grab a condenser while you're at it. I've seen some crazy issues when those get tired. Or stash those and drop a Pertronix in there. Keep the old parts in the trunk in case the Pertronix fails. You've been around long enough to know you can't trust modern parts like you once could. 5k miles is an eternity for some of the crap that we have available. Even if it *does* say Bosch on it. Posted: Tue Aug 14, 2018 3:55 am Post subject: Re: What did you do to your Bug Today? I have a spare set and will swap them out. But after this replacement set dies, I'm going back to an electronic module. Posted: Tue Aug 14, 2018 5:06 pm Post subject: Re: What did you do to your Bug Today? 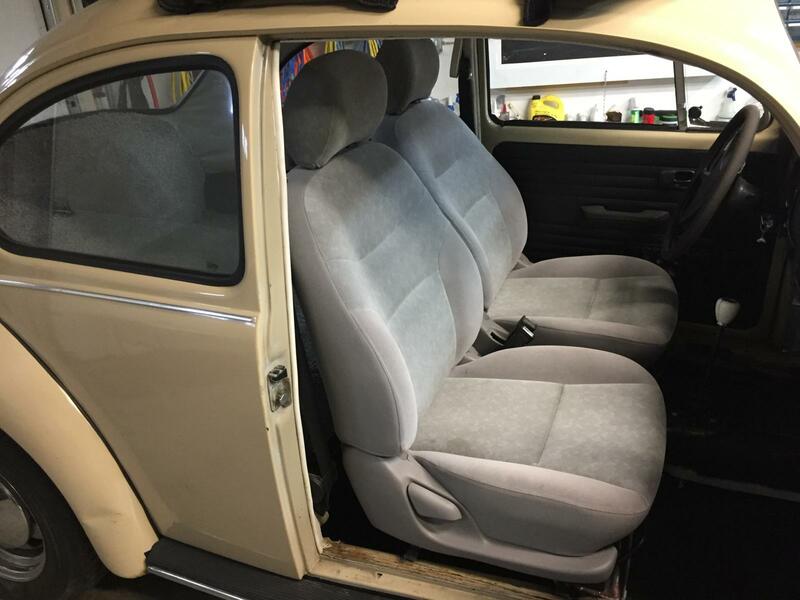 My 1973 beetle project is nearing completion. Over the weekend I mounted the rear bumper with new grommets. I was lucky to find an original German bumper in good condition. Posted: Wed Aug 15, 2018 9:23 pm Post subject: Re: What did you do to your Bug Today? Posted: Thu Aug 16, 2018 7:09 am Post subject: Re: What did you do to your Bug Today? I drove my 1970 sedan to town to do errands, tightened up it's home-engineered engine lid hinge hardware, noticed that my engine (2016 home-assembly after machining, now with silicone oil strainer/cover gaskets) and MoFoCo April 2018 rebuilt transmission are leak free, a first for me !!! Posted: Thu Aug 16, 2018 10:19 pm Post subject: Re: What did you do to your Bug Today?